The past few weeks have been hectic for me with work events leading to busy days and claiming half of each weekend. I have also been on countdown to a much-anticipated holiday which is always a sure-fire way to make the weeks seem longer! But this past weekend was a chance to slow down a little and catch up with friends. We had a baby shower planned for my friend Nelly and, in preparation, a baking day with my friend Jane. Nelly and I have been friends for almost 10 years; she has been there through the laughter and the tears, in fact, she’s one of the few who can turn my tears into laughter. 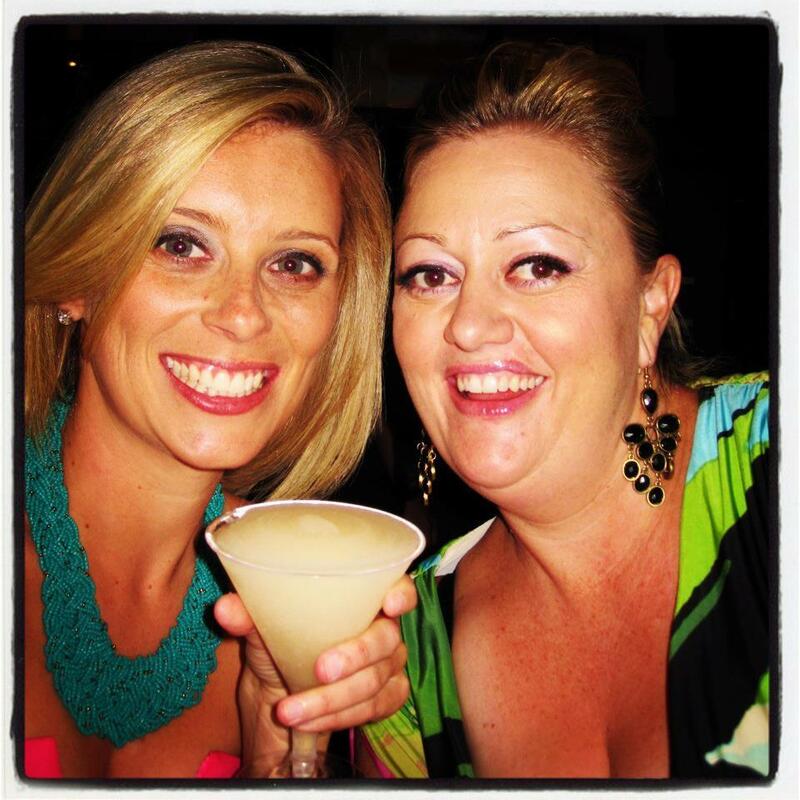 What a difference a year makes … Nell and I on NYE 2011/12. We have welcomed in new years together, celebrated birthdays, seen boyfriends—and fashion trends—come and go, rocked a Riverfire, danced the night away, shared potato gems at the rugby and clocked up hundreds of kilometres walking and talking our way around New Farm. This year, I’ve also had the privilege to watch her fall in love. And, in just a few short months, I’ll be there as she starts a new chapter in her life—as a mother. Excited by the impending arrival of the newest member of our group, Jane and I offered to throw Nelly a baby shower. We had planned helium balloons, decorations and games but let’s be honest … the food is where it’s at! Which is how I came to be partially-covered in icing and coconut flakes on Saturday as part of a crash course in cake decorating. I should also admit I had some cake crumbs left on my face after a stint as ‘quality control’. Thankfully my fellow party planner, Jane, also happens to be the beauty, brains and beaters behind Miss Janes’ Cakes, so I convinced her to take me on as her apprentice for the day. A long time baking afficinado, Jane admits to taking days of school as a youngster so she could stay at home and bake cakes for her family. Now a professional with a full-time job, she’s turned her love of cakes and their smaller counterparts, into a growing (and delicious) business. 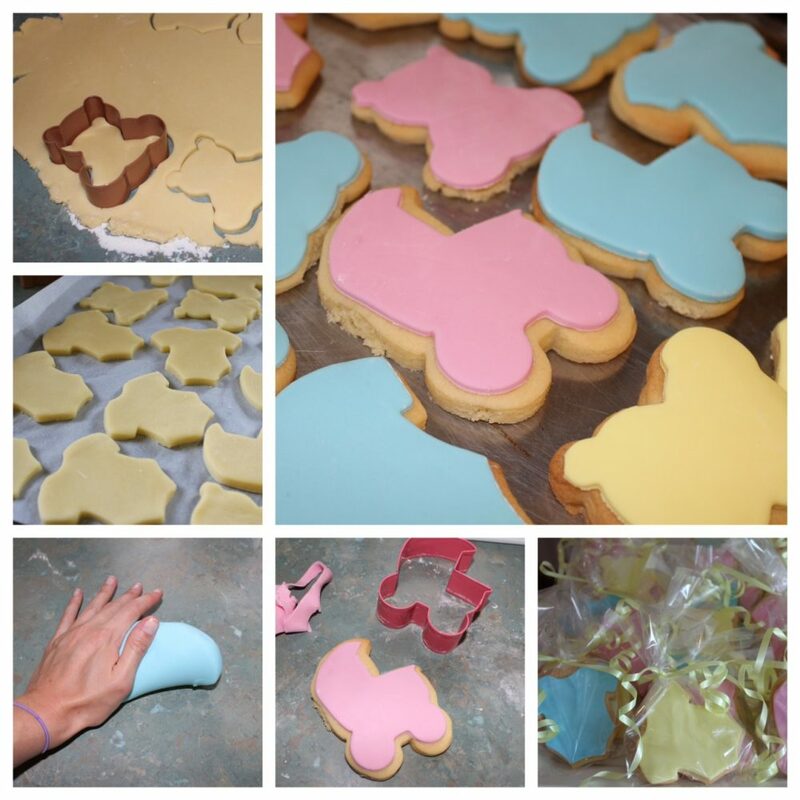 To kick off the sweet treats for Nelly’s baby shower, we started by baking some baby-themed cookies using a super easy recipe for sugar cookies from Linda at Bubble and Sweet. Once the ingredients were mixed together and the dough had chilled in the fridge for 30 minutes, we cut out our shapes—a teddy bear, pram and baby’s outfit—using a four-pack of cookie cutters picked up from Spotlight for under $10. After our cookies were cut, they went back into the fridge for 30 minutes before being popped into a pre-heated oven for 15-20 minutes. Once golden brown, they were set aside to cool before we could decorate them. A few had expanded slightly but their shape was still discernable and to add a little colour we chose to top them with pastel pink, blue and yellow fondant. When it comes to working with fondant, it can dry out quite quickly so Jane suggested we just start with a small amount and leave the rest rolled up in cling wrap until we needed it. You can use white fondant and add coloured gel to it but luckily we had some pre-coloured fondant (we used Bakels RTR (ready to roll) fondant) to work with which reduced the amount of kneading necessary. Our fondant colours were a bit too bright so we toned them down by kneading some white into the coloured fondant. It was clear Jane had far more practice than I did because her colours were mixed in no time while I continued pounding away with my tiny (and somewhat useless) hands! In order to stop the fondant from sticking, we dusted the kitchen counter with cornflour (although you could use icing sugar) and we also made sure the cookie cutters were dry and dipped in cornflour before we started cutting. We cut the fondant using the same cookie cutters as we had the biscuits and then brushed a small amount of water onto each cookie so the fondant would stick to it. With the cookies done and ready to be individually packaged and tied with ribbon, it was time to bring out the big guns—the cake. Jane had chosen a vanilla buttercake with lemon syrup, lemon buttercream and finished with organic coconut chips as our project. Simply hearing the name of the cake had me in awe. With a limited amount of time for our bake-a-thon, Jane had pre-baked the cakes and there were two round vanilla buttercakes cooling on the bench upon my arrival. It was then time for my masterclass in icing application to begin. Making the buttercream was easy; beat butter until pale, gradually add icing sugar and, in the word’s of Miss Jane, “beat the crap out of it”! For an extra dash of deliciousness we added finely grated lemon rind and a tiny bit of juice. Once the buttercream was done, we put it to one side while Jane showed me how to cut the top off each cake, and then cut it in half through the middle, so as to make a flat surface and two layers per cake. Jane topped the bottom layer of one cake with her homemade lemon syrup for added zing before covering it in buttercream and adding the next layer of cake. This continued until the top layer when it was time to cover the top and sides of the cake in icing. Now, I don’t know about you, but covering the sides of cakes in icing is where I always go wrong; it never looks right, it’s rarely smooth and there’s always crumbs mushed up in the icing. Turns out what I need is a turntable (not the DJ kind, more of the ‘lazy Susan’ Chinese restaurant kind) to spin my cake on and an offset spatula. You can spin the cake by hand, but a turntable makes it easier. According to Jane, the key is in de-crumbing your spatula after each application. She also recommends you don’t lift it off the cake, just sweep it backwards and forwards until the icing is in place. Then wipe off the spatula before each new blob of icing. Some bakers even go as far as putting on one layer of icing, then popping the cake in the fridge until the icing is set and then adding a new, crumb-free, layer of icing. For that little extra—and to make the cake look soft and fluffy like a towel—we added organic coconut chips simply by pressing them into the icing. We kept a few aside to add just before the party for added crunch! 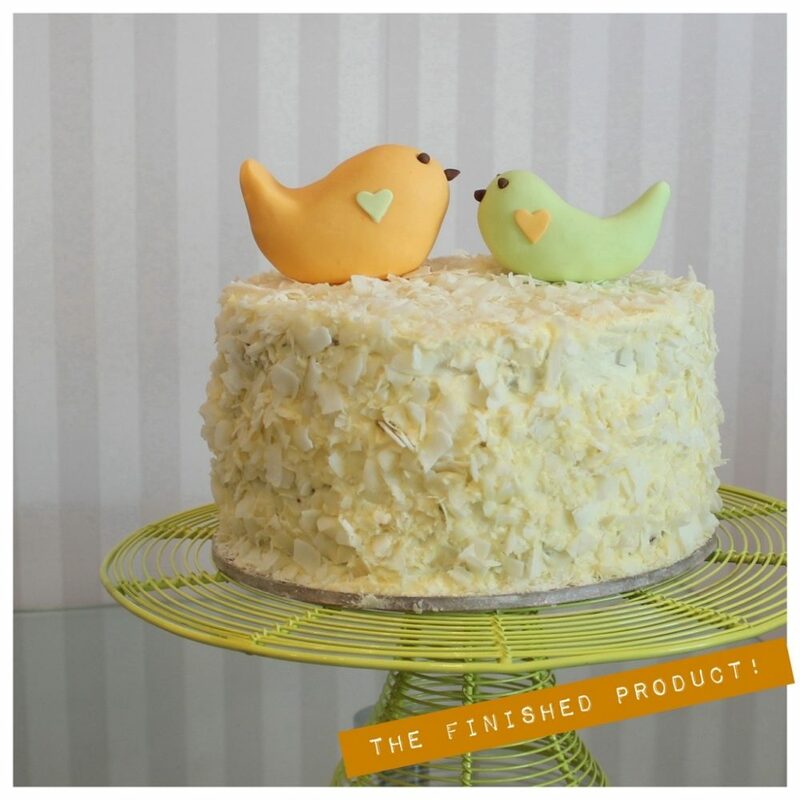 To top it off we made a mumma and baby bird out of fondant to match the invitation. Perfection. To Miss Jane: A big thank you for sharing your kitchen with me. I can’t wait to get myself an offset spatula and try icing the side of another cake! Hi Brooke, thanks for keeping me entertained. Bestest blogger and great photography. Your a star. PS see you around the track soon.